A period look at essential, useful and interesting equipment for the home kitchen. Any overview of kitchen equipment begins with knives, the most essential tool of all. Knives are the front line of food preparation--you're not going to get very far without one. Knives are versatile too. Whenever I see some supposed "space-saver" gadget, I usually think, just get a good knife. If you have a small kitchen like me, this becomes even more important. Knives are compact--they're the ultimate kitchen space saver. Buying knives can be daunting. What works best is mostly a matter of personal preference, although there are some things to consider in terms of form, material and utility. Form. Kitchen knives generally take one of two basic forms: stamped or forged. A stamped knife has been cut out of a larger sheet of metal and then sharpened. A forged knife is pounded into its shape from hot steel. Because of this, forged knives tend to feel weightier and appear thicker than their stamped counterparts; they also have a bolster, a bump of metal between the blade and the handle that provides protection from accidentally cutting yourself. Although forged knives are generally considered "better," sometimes the thinner, more flexible stamped knife can be useful. Some people may be attracted by the "ever sharp" style of knives, knives with a serrated blade that you don't (or rather can't) sharpen. I would not recommend getting a whole set of these. They aren't nearly as sharp as a true honed blade, so they make a poor substitute for real fine-edged knives. Material. 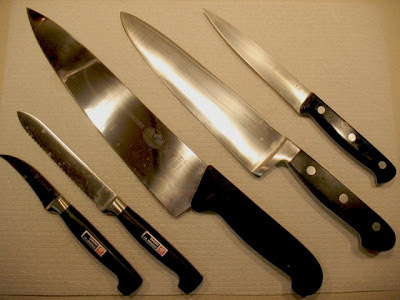 Most kitchen knives are made from steel, although there are plastic and ceramic ones for special purposes. Carbon steel holds an edge well and is easy to sharpen, but is vulnerable to rust and stains. Stainless steel doesn't rust, but it must be sharpened more frequently. Pay a little more and you can get carbon stainless steel, an alloy that represents the best of both worlds. Utility. Here's where it gets tricky. Before buying any knives, you should consider which specific knives you will use the most. Some, like Mark Bittman, contend that you only need three knives: a chef's knife, serrated bread knife and paring knife. Personally, I have five knives that I use the most, but since most of my knives come from two sets, I also have knives I hardly ever use. You can buy knives individually, but most knife manufacturers sell pretty sets of knives housed in wood blocks. Whether a set is more economical than buying knives individually depends on what knives you want to use. If you buy a set, you probably won't use all of the knives. However, it might be worth it if you get a price break for the few knives in the set that you will use, so consider which ones you really want, price them out separately and then compare that to the set price. A knife block is useful for storing knives, although you could also use a wall-mounted magnetic strip. My knife collection is composed of two sets plus a few other miscellaneous knives. One set is from Zwilling J.A. Henckels Four Star, a forged carbon stainless set of five knives plus scissors in a block. I love the handle and the heft of these knives. Growing up, we had a few of these, and I always preferred them. My set retails for $541, but Amazon sells it for less than $200. My other set is J.A. Henckels International Fine Edge Pro, a stamped stainless set of five knives. The exact set I have is no longer available, but a similar set retails for $152 (and $64 at Amazon). Clearly, they are less expensive, but that doesn't mean they aren't useful. They require more frequent sharpening, but I've had them 12 years and still get a lot of use of most of the pieces. 1. 3" paring knife (Zwilling J.A. Henckels Four Star). A paring knife is essential for tasks that involve small pieces of food or require precision. This paring knife is incredibly sharp--it slices a lime in half like the lime was butter. I use it for things like that, cutting off the rough ends of garlic cloves and very fine mincing. Among my knives, I use this the second most. 2. 7" santoku knife (Zwilling J.A. Henckels Four Star). I know the chef's knife is the classic all-purpose kitchen knife, but I got a santoku when they they started being trendy a few years ago and I really prefer it to a chef's knife for a lot of tasks. I think it's just a matter of what you're used to, since they are quite similar. This is the knife I use the most, particularly for chopping. 3. 8" chef's knife (Henckels International Fine Edge Pro). Since it's a stamped knife, this lacks the heft of a forged knife. So even though it's a chef's knife, I don't find this ideal for chopping. However, it's thinner blade makes it perfect for slicing larger items, like fruit (I cut my oranges into wedges with this every morning). 4. 7.5" bread knife (Henckels International Fine Edge Pro). This isn't a particularly versatile knife, but when you need to cut bread, this is what works best. Trying to cut bread with a chef's knife will usually result in squishing or crumbling it. This does neither. 5. 5.5" boning knife (Henckels International Fine Edge Pro). Here's where the flexibility of a stamped knife can be useful. I'm not very good at cutting up a whole chicken, but when I need to do so, this is what I use. The thin knife provides good precision. It also works well for cubing chicken breasts. 1. 2.5" peeling knife (Zwilling J.A. Henckels Four Star). This is the knife I never use. It's concave blade leaves me a bit puzzled as to how to use it effectively. I can't think of any task I couldn't perform more easily with eiher a paring knife or a vegetable peeler. 2. 5" serrated utility knife (Zwilling J.A. Henckels Four Star). This, like the peeling knife, is the kind of knife you get in a knife set and then never use. Supposedly, it's good for slicing tomatoes, but I find a sharp chef's knife works just as well, if not better, since you lose precision with a serrated knife. I did use this to slice a grapefruit in half this morning, but I could have used the chef's knife. 3. 10" chef's knife (Victorinox Fibrox). This was just a mistake. Cook's Illustrated raves about the Victorinox line of kitchen knives as a high-performance, low-cost option. I wanted to give it a try, but I shouldn't have bought a 10-inch knife. It's just too big to be useful. If you have big hands, you might like it, but I never use it. Even if I had a smaller one though, it lacks the heft of the Zwilling Henckels knives I use for chopping (the Victorinox is a stamped knife), so I'm not sure I would prefer this anyway. 4. 8" chef's knife (Calphalon). Calphalon?! What am I doing with a knife from a pots-and-pans company? That's a good question. I think this ended up in my kitchen back in the day when I only had the Henckels stamped set and wanted a heftier, forged chef's knife. It's certainly hefty--the heaviest knife in my collection. But it dulled really fast. It's also so thick that it can get stuck in food. I don't think I paid much for it and I got what I paid for. 5. 5" utility knife (Henckels International Fine Edge Pro). People who assemble knife sets seem to think you need a bridge between the small paring knife and the large chef's knife. I think otherwise. Despite its name, I find little "utility" in this knife. It's too big to be useful as a paring knife, too small for carving, and too slight for chopping. You can slice with it, but nothing too big (it's not even large enough to cut through a grapefruit). Basically, there's nothing this knife does that other knives couldn't do better. So why bother? Parting thought: One final word on knives--keep them sharp. 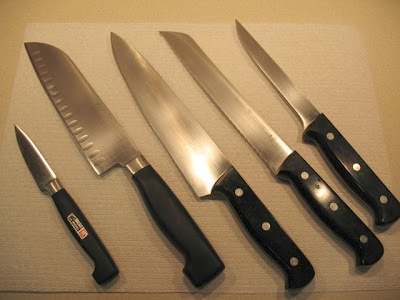 A dull knife is the quickest route to a kitchen injury. Sure, a sharp knife will slice you more easily, but it's not likely to happen if you're paying attention. Dull knives are actually more dangerous because they can act in unpredictable ways. Thus, you are more likely to cut yourself with a dull knife than a sharp knife. And when you do, since it's dull, it will hurt. So run your knives over the honing steel regularly (you can do it every time actually) to keep the blade straight and sharpen your knives when they begin to develop a dullness that the honing steel doesn't address.